A luminous round cut diamond appears to burst from the face of this classical 14K bi-color engagement ring. 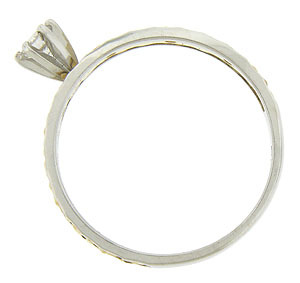 A floral inspired yellow gold ribbon twists around the center of the ring, while faceted, white gold bands frame the cutwork center. 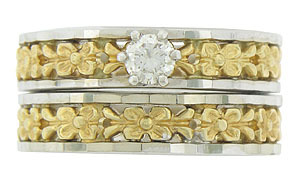 Shown with the matching wedding band WB3242 (sold separately). 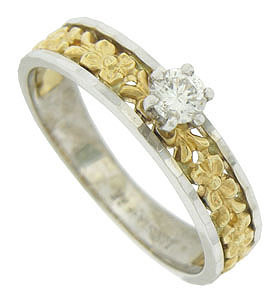 The estate ring measures 4.43 mm in width. Circa: 1970. Size 6 1/2. We can re-size.